And adventures she has certainly experienced: travelling to all seven continents, over 40 countries, many of them third-world countries. All for the love of documentary film. 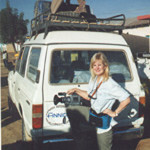 One of Voss’ most memorable adventures took her to Ethiopia for a month shooting a documentary on the African country. Ethiopia as a dynasty dates back to the second century B.C. It currently has a population of over 82 million. While most of its history saw monarchical rule, it now is fragile politically. 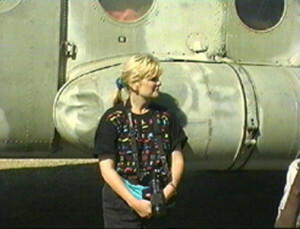 Voss, partnered with her cameraman, toured that world in a 50-year old MI-17 helicopter, shooting in cities, villages and rugged terrain. The helicopter had been built in the 1960s in Russia, spent years in Cuba, and now is in service based in Ethiopia’s capital city of Addis Abbaba. Ethiopia has 38 MI-17s. Voss travelled in one of the only two now functional. Voss describes her trip as a day-by-day challenge. There were local politicians expecting bribes (even with an authorization letter from the nation’s President). At one location an angry mob hundreds strong threw spears at them. Wild boars chased them. Their helicopter broke down, leaving them stranded hundreds of miles from help. For third-world country assignments, she usually teams with a single cameraman. That allows them to travel with a low profile, looking more like tourists and getting access to unique stories and exceptional footage. But she always hires locals to help with baggage and translating. Her cameraman must also be expert with sound and lighting, as well as technically adept at equipment repair in the field. And be up for the adventure! As sick and discouraged as she was, she realized to her dismay, getting home would be an even greater ordeal: a 12-hour ride over treacherous mountain roads, then back in the “death-trap” helicopter, then change to a Twin Otter to fly over 15,000 foot mountain peaks with no oxygen, then a 10-hour flight to Frankfurt, another 10-hour flight to San Francisco, and finally a three-hour drive to her home. “I’ve never felt so stuck and hopeless and really, really sorry for myself,” she says. With doses of Imodium and Cipro she managed to shake the worst of the sickness. By morning she was ready for the next adventure. When filming in another country, Voss logs all the material from each day of shooting, and incorporates it into a diary of what occurred that day. She’s also the scriptwriter and editor on each project, so being the videographer on location gives her a true feeling of what a country or culture is all about. “I’m always given a rough outline for the projects in other countries,” she says. “But they always just want me to ‘do my thing.’” That’s the only way to go, she feels. Trying to follow a detailed outline or a predetermined shot list will cause her to miss things and end up with what she terms a very non-creative result. The shot list works for a movie, she admits, but not for documentary work. “Out in a third-world country every single day is a new adventure, a new story, a new life-changing moment, a new miracle.” She believes the only way to find stories for potential projects is to be out there. “The world is full of amazing stories,” she says. In the middle of a shoot, when things go wrong, she will fight to maintain focus. “It’s the only way to make sense out of chaos.” She goes on to say, “If I’m in another country, I’m so thrilled about the adventure of it, anything negative looks like an opportunity.” A great attitude for any filmmaker. Voss runs a full service production and post-production studio, PostImpressions, based in Northern California.